For policies to be effective, they should be sound. For any business, such policies properly elucidated and correctly understood by all concerned in it are a prerequisite for efficient programme designing and its effective implementation. The policies should be based on organization objectives, i.e., what purposes and objectives the business has in view to achieve and how these can best be achieved. It should clearly reflect the principle, concepts, practices and philosophies of the organization. Further, the policies should be capable of relating organization’s objectives to other factors. It should be noted that when a policy fails to take into account inconsistencies between organization objectives and personal objectives of individuals and groups, the firm will find itself seriously hampered in trying to achieve its objectives than the company’s personnel in trying to achieve theirs. For this reason, a harmonious integration of these objectives is particularly important. The policy should be stated in definite, positive and clear understandable terms. Unambiguous statement of policy is necessary for a clear understanding of it on the part of those affected by it. Clarity is the essence of a good policy so that everyone in the organization knows what it proposes to achieve. Clear-cut policies should minimize the number of situations in which decisions must be based on personal opinion and hastily collected information. Regardless of the size of the firm, policies should be reducible to the point where they have significance for each individual in the organization. Such policies are more easily formulated and applied if they are reduced to writing. 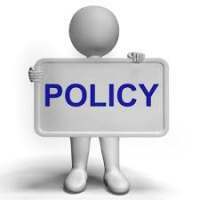 Preferably, policies should be written so that they can be integrated within systems and policy manuals. 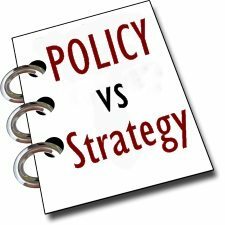 A policy, conceived as a management tool, does not exist unless it is in writing. 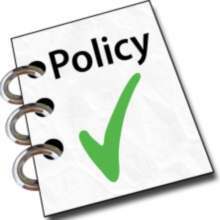 Written policies make a commitment on the part of management, employees and others that “the top management does what it says.” They ensure uniformity of application, and assure continuity of action even when the top management is changed. They limit the freedom of action on the part of the management, for the foreman cannot go off half-cocked and come up with his personal interpretation of the organization’s intent. They help to ensure that professed policies are ‘right’, for an organization tries to put its best foot forward. The policy must be reasonably stable but not rigid. Stability implies firmness and constancy. Such a stable policy inspires confidence in the minds of the employees, customers and dealers. It should not be altered frequently, but should be stable for a fairly long time, say two to three years. Frequent changes in policies often create confusion in the minds of those who are to follow these. The policies should be periodically reviewed, evaluated, assessed, and revised and should be in tune with the challenge of circumstances, needs and urgency of the company and changes in the environment. If modification is to be made successfully, the management must constantly study economic trends within and outside the community, and of the effects of changes on the suitability of prices. ‘Flexibility‘ refers to the ability to adapt to short-run changes. It should have an inbuilt resilience for adjustment from time to time. An example of the long-run change is the increase in hiring of women and minority groups, while the short-run change would be seasonal and cyclical that might affect the hiring of these groups for a short run. The policy should be sufficiently comprehensive in scope and should cover, as far as possible, all issues that are of interest to the firm. The comprehensiveness of a policy can be checked by listing the organization’s major functions and sub-functions along with its managerial functions and sub-functions, all of which should be covered by policy statements. If there are no policies stated for some of these areas, a deficiency in comprehensiveness may be said to remain in them. All policies in the functional areas of business must be complementary to one another. An example is the manufacturing policy that complements the production policy so that these two functions can be coordinated effectively. Supplementary policies add to and extend the overall organization policies from which they are derived. Overall policies that are directed towards the achievement of economic service objectives can be broken down into supportive policies, which can further be separated as lower-level policies. A firm’s advertising policy, for example, should supplement the overall marketing policy which, in turn, should supplement the economic service objective. Thus, lower-level policies are supplementary to the highest or superior level policies. If the policies are not supplementary, there might be a conflict between the departmental policy and the overall policy, and that would be tantamount to insubordination. The business policy should also be consistent with the public policy, The principle of consistency, for example, should be followed in the selection and training of employees. In choosing sales people, the personnel manager should hire individuals who not only know the merchandise they will sell, but also have the capability to meet customers and being at ease with them. Then all employees should be trained in such a way that customers may receive substantially the same type of treatment from every representative of the firm with whom they come into contact, whether he be credit manager, salesperson, or deliveryman. The policy should be fair to all, offering equity and justice to those who are affected by it. Besides, it should be reasonable, i.e., capable of being implemented. The policies to be effective should be in accordance with the accepted ethical standards of business, i.e., they should not only avoid what is “wrong“, but also what is “bad or immoral“. In other words, the policies should be indicative of the intention that the business is aware of its social responsibility towards the concerned people and the institution. The business policy must be a planned development rather than the result of opportunistic decisions on the spur of the moment. Naturally, not every problem arising from the functioning of a firm can be foreseen or solved on the basis of an established policy. But though there will usually be a very large and important area in which judgement of management will be the only guide, yet routine activities should be carried on in a manner specified the policy. The general business policy should lead to the development of a clear cut character or responsibility for the establishment. Having individuality offers several competitive advantages. For one thing, it enables the firm to build up a strong clientele whose patronage does not depend on a constant promotional barrage. Further, it tends to reduce the vulnerability of the firm to direct price competition, although individuality may be acquired through a policy of low and competitive prices. consistent with other policies and allows discretion to the manager responsible for its implementation; and is in conformity with the economic principles, statutes and regulations and compatible with the public interest.